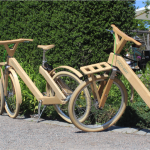 Sweden is ranked as The Most Sustainable Country in the World… Come get a little taste of that as you get to experience the most breathtaking views of Stockholm while riding on the most unique transportation ever – our very own handcrafted wooden bikes! 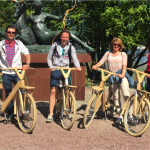 Starting off in the heart of the city, our bike tour takes you to see all the landmarks and famous locations while taking you through the intimate and well-hidden bike lanes that only a true Stockholmer knows about. We will cover the islands that has given the city its nickname “The Venice of the North” as well as give you valuable insights into fun things you can do, parks you can enjoy time in and amazing restaurants you can indulge your appetite with. Continuing our adventure on some of the 760 kilometers of bike lines that runs through the city we will ride out to the worlds first ever city national park and let you experience what true nature in metropolitan city really feels like: amazing! We encourage you to bring your camera as you will undoubtedly see skylines, panoramic views and natural beauty that is worth capturing in a lens. 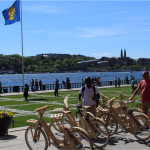 Stockholm is constantly voted as one of the most beautiful and bike friendly cities in the world… let us show you why! Tours start at 10:00AM or 12:30PM everyday. For private tours we can accommodate your preferred starting time. The tour last for 2 hours. 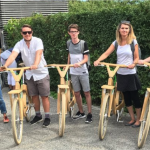 The tempo is enjoyable, everyone over the age of 16 who can ride a bicycle is welcome! Tours are always in English. For private tours we can accommodate your preferred language.